Kirsten and I are staying in a family owned hotel right on the beach of Rocafuerte. Every afternoon we deliver the workshop in Palestina, a community 10 minutes walking on the beach, a bit of waiting in front of a panaderia (bakery) and about 15 minutes of bus away. 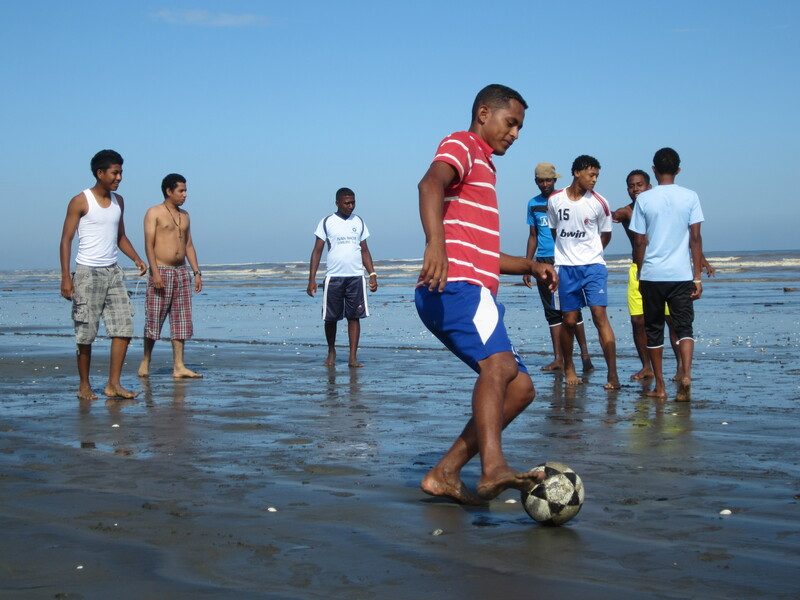 The first words that come to my mind when thinking about this community and my time here are: music, sea, smiles, joy and football. This is most likely a very superficial first impression from my ‘honeymoon’ phase, but I would be lying saying that I feel like I have been working in a ‘poor’ or ‘underdeveloped’ community. Let’s make things clear, my development ego would definitely find a bunch of obvious indicators of poverty, but as I mentioned he is gone on vacation. People seem happy here- and happiness and poverty don’t fit well together, right? We have been sharing the hotel with two older northern Italian men (!!) who for a weird combination of still unclear reasons are spending a 40 days vacation in Rocafuerte. ‘The Italians’ would deserve their own personal soap opera. Complaining is their only hobby which they practice almost religiously. It seems like the way things work here simply cannot fit in their heads, and the tone they use to talk about this community is to my ears disgustingly Eurocentric. I thought that talking to them would give me a fresh prospective of what this community is ‘missing’… Instead, they surprised me with a brilliant development cliché. They explained to me that in Italy people have so much and here people live very basic lives. What is so strange is that ‘qui non piange nessuno, mentre da noi piangiamo tutti! !’ (here nobody cries, while in our country we are all crying!!). Trillions of complains apart, ‘the Italians’ are left perplex, intrigued, and I think at times almost annoyed, by the joyfulness they see all around. ‘The Italians’ seem to have an opinion on everything and their comments irritate and amuse me at the same time. Their presence here adds this surreal layer to everything else we are experiencing: Our participants’ amazing vibe, the beauty of this place, the reflections Kirsten and I have, what our participants decide to share, the phrasing the use, the things they don’t say …Development ego dismissed, I have lots of pieces to start building the 100 Voices puzzle. Posted in 100 Voices, EcuadorTagged 100 VoicesBookmark the permalink. We really need to catch up and have a loooonnnnnnggggg talk.